Lloret de Mar, The ultimate holiday resort for energetic people, nature and culture lovers. Looking for more excitement than just laying on the beach, find out what Lloret de Mar has to offer you. You will have a holiday of a lifetime! 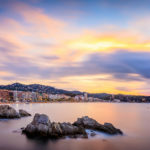 Visit Lloret de Mar in the Costa Brava! In the south of the Costa Brava in Spain, you will find the very lively and popular resort Lloret de Mar. Lloret de Mar is one of the most popular seaside resort in Spain and therefore attracts over 1000nds of tourists from all over Europe. 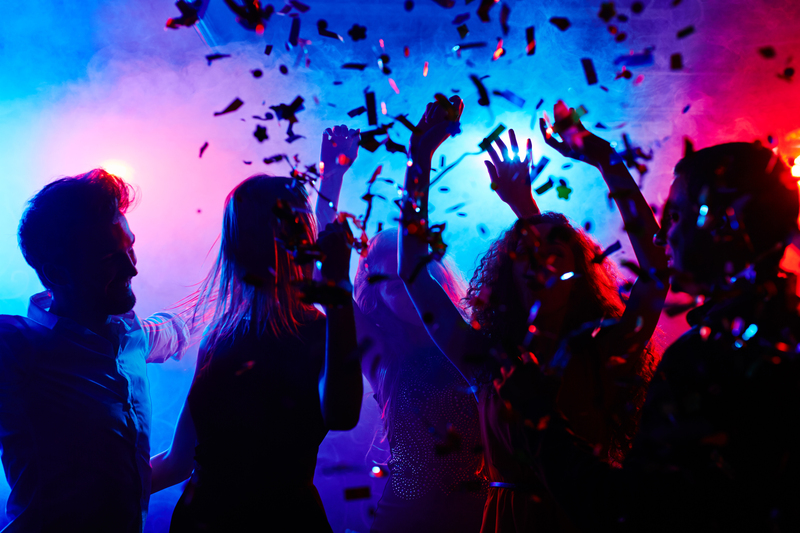 Lloret de Mar is also known as the ultimate party paradise for young people and therefore for party location number 1 on the Costa Brava in Spain. Lloret de Mar offers a fabulous nightlife with many discos and bars. However, Lloret de Mar definitely has much more to offer than just partying. Thanks to the beautiful beaches, the many nearby attractions and the beautiful nature parks in the surrounding, Lloret de Mar is also very suitable for those how are looking to discover the real Spain! If you have to believe the media, the only cultural thing Lloret de Mar has to offer is a jug of Sangria. Nothing is less true, Lloret de Mar and its surroundings have plenty of cultural attractions that are well worth a visit during your vacation. Just look around and you will soon see what beautiful things the former fishing village of Lloret de Mar has left to cultural heritage. There is plenty to do and see in Lloret de Mar that is worthwhile visiting during your holidays in this amazing city. Touch the feet of the beautiful Dona Marinera and make a wish. From the beach of Lloret de Mar you can walk along the coastal path to Dona Marinera, the fisherman’s wife of Lloret de Mar. It is however not the Statue of Liberty in New York Bay,but the place in Lloret de Mar is definitely worth visiting (especially at sunset). There are rumors that if you touch the feet of the fisherman’s wife and look at the horizon at the same time you can make a wish which will come true. If you continue to follow the coastal path along the beautiful Cala Banys you should definitely take a look at the Castell de San Joan. The castle was built early in the 11th century, but unfortunately in the 14th century it was made almost equal with the ground. In the 15th and 16th centuries the castle was renovated into a similar appearance of the present ruin, so you can imagine what it looked like then. Your imagination becomes reality during the great summer festival in July. Every year they organize a sea procession with a trip to the church, Ermita Santa Cristina. One of the real beauties of Lloret de Mar. There is far more nature to see than only the sea, On a sunny day one of the Botanical Gardens invites you to come for a relaxing stroll. Step into the Garden Tour bus that leaves from the bus station in Lloret de Mar and step off at some several stops, such as the botanical gardens. 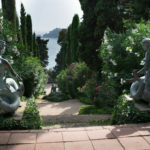 Near to Lloret de Mar is the garden of Santa Clotilde. There are two more in the area, Pinya de Rosa and Marimurtra. The garden tour bus also has a stop at the boulevard of Lloret de Mar. When you get of the bus at the boulevard you can just walk to Iglesia de Sant Roma. A beautiful impressive Gothic church with influences of the Renaissance. Once you´ve turned around the corner of the busy shopping street you will be amazed of this unique building you will see. At the left of the entrance you can enter the part of the church. Outdoor you can discover more beautiful details of Lloret de Mar. In the residential area Roca Grossa you can find an archetypal outdoor museum, Puig de Castellet. The ruin tells her story of a small residential community in the 3rd century before chr, that tried to find security behind a large wall with towers. With or without money almost every women loves to shop! It is great to walk along the beautiful boutiques and interesting shops. Lloret de Mar has a nice center with plenty of shops. Whether you are looking for shoes, clothing or souvenirs you can walk around in the cozy shopping street for hours. Many famous shops are present in the center such as the Mango, Shana, Pimkie, Vives, etc. Do you like to visit places and see things during your holiday. Lloret de Mar has more than enough activities to offer you! 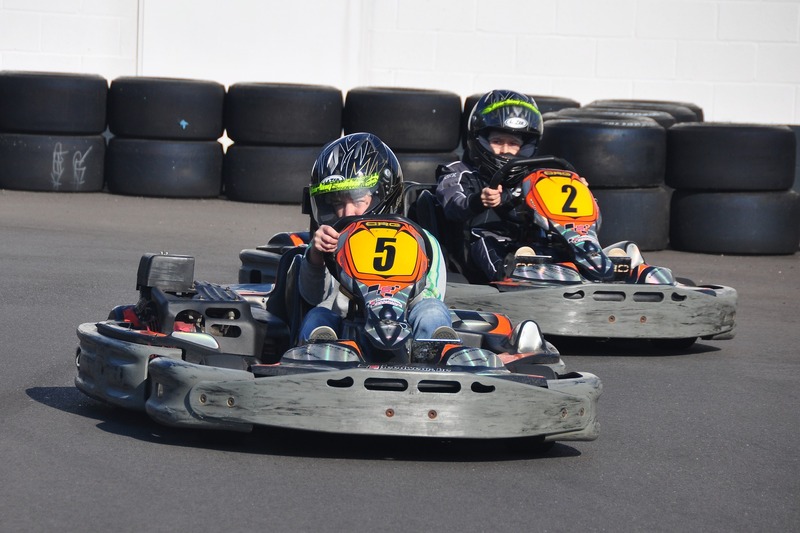 Go with the whole family to a grazy wild waterpark, or what about a race on with Go Karts! Enjoy an unforgettable day in the biggest theme park of Europe, Port Aventura. Or go Shopping!! You and Your children will love Waterworld! Looking for a holiday to spend some quality time with your family. Even for children Lloret de Mar is a perfect holiday destination. Besides all the fun your children will have in your own swimming pool of your luxury holiday villa from Clubvillamar they will certainly enjoy a day out to Waterworld. Located just outside Lloret de Mar. Not only your kids will love it but even for you it is a very successful day out. The many Wild crazy slides provides young and old for an unforgettable day. But what about water fun AND animals?! You should definitely go to Marineland where you can swim with dolphins and see all other animals that live in the sea. Both parks are recommended, from the center of Lloret de Mar daily free buses go to and from the parks. Or what about an awesome children’s park!? Climb on the monkey bars or swing on the crazy swings. Everything is possible in Gnomopark just outside Lloret de Mar, direction Blanes. This park includes a children’s indoor and outdoor playground, bowling, mini-karts, trampolines and a large “survival “area. And if you need to catch your breath you can take your lunch and eat it at the picnic area. If you didn’t bring your lunch no worries there is a restaurant where you can get all kinds of snacks. Still looking for more excitement? Go Karts, for all speed freaks the ideal place to step on that gas pedal and speed up! The kart track is located just outside Lloret de Mar, from the center free buses run. Don’t you just love the rush you get from a rousing terrifying rollercoaster? The largest theme park in Europe, Port Aventura! Only one hour’s drive from Barcelona, between Tarragona and Salou, you will find the large theme park Port Aventura, part of the Universal Mediterranean park. The park has many attractions including some very impressive rides. Let yourself shoot into space, make flipovers and spin yourself around. You’d better buy a pack of strep sels because after a visit to this park you will be hoarse for sure. Love to shop? In the area of Lloret de Mar you will find three large shopping centers where you can shop till you drop! So bring out the credit card. Matero Park is a large indoor shopping center near Barcelona. A supermarket, cinemas, a bowling center, an entire floor full of restaurants and of course lots of shops! All major chains are present, such as Mediamarkt, MS Mode, C & A, Douglas etc. The biggest outlet center in Europe! Here you can buy clothes from national and international top brands for very low prices. A large indoor shopping center just outside Girona. All known stores are present such as Zara, Miró, Drim, H & M, Oysho, Massimo Dutti, Bershka, Pull & Bear, Springfield, Vives, etc. Are you starting to get tired or perhaps you are starved after all the shopping?! On the top floor you will find several restaurants where you can have lunch or just take a rest. What’s nicer than surprising your family or friends after your holidays with a typical Spanish souvenir of your unforgettable holiday in Spain. When you buy your souvenirs you must try the famous haggling trick. There is no place better to practice your skills than on the market. 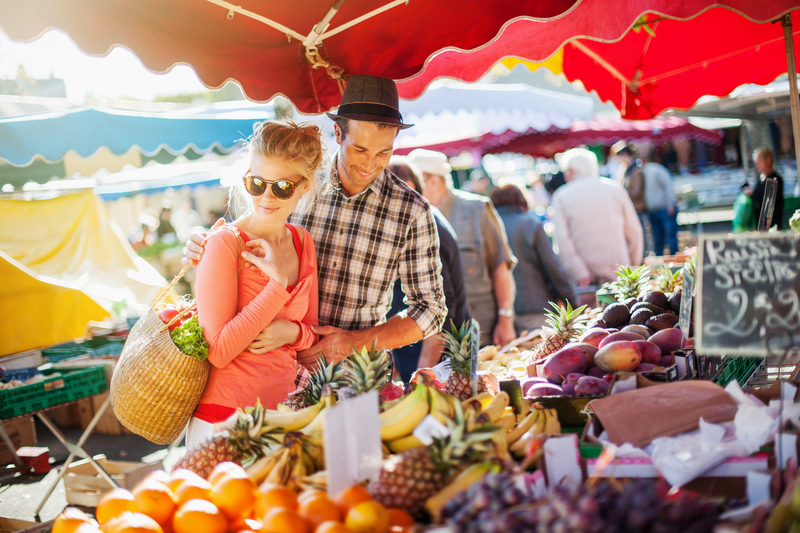 In the Costa Brava you can find different markets. After having a relaxing day in your villa, the next day you will have more then enough energy for some action! Jump on your bike and go for a ride in to the hilly area. Or put on your hiking shoes and go for a strenuous hike into the hills. Are you looking for something to cool you down, Lloret de Mar has plenty possibilities of water sports. 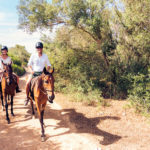 Off course you can spend your holiday totally different, for example a challenging game of beach volleyball with the family or go horse riding in the beautiful surroundings of Lloret de Mar. How about a morning on the golf course with the relaxing sound around you of birds chirping. For who would like to have an active holiday, there are enough activities in Lloret de Mar and its area. Can you imagine how romantic it would be to go horse riding in the mountains of northern Spain. Within about 20min drive from Lloret de Mar you will find the stables Cal Xebro where you can hire a horse for a day. You will be picked up and brought back to the center of Lloret de Mar by a small bus. Can you already see yourself on a beautiful golf course looking at the horizon on a lovely warm summer day. Lloret de Mar is a paradise if you like golf. There is not only a court in Lloret de Mar, there is enough choice in the surrounding to golf. Here are a few of the best golf clubs in Lloret de Mar and its surroundings . – PGA Golf de Catalunya. The largest golf course near Lloret de Mar, with 36 holes and 2 golf courses you will certainly not get bored. Beautiful sea links course with firm level differences in a beautiful setting. This beautiful club has 27 holes and 2 golf courses. – Club de Golf Costa Brava. Just outside Lloret de Mar you will find this beautiful hilly course with challenging holes. Beautiful course, a warm welcome and a cozy clubhouse. And if you don´t have a lot of experience, this course is also suitable for less experienced golfers. Love to do sports but is the weather just to hot for you. What about a swim in the ocean or isn´t that just challenging enough for you. 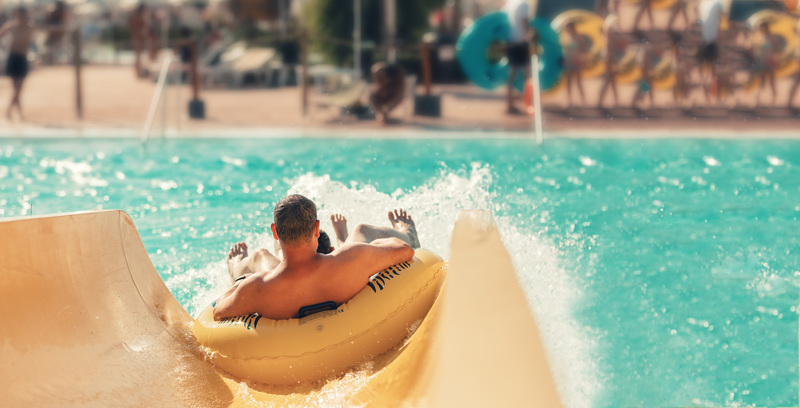 Brace yourself for all the water fun you can find in Lloret de Mar. 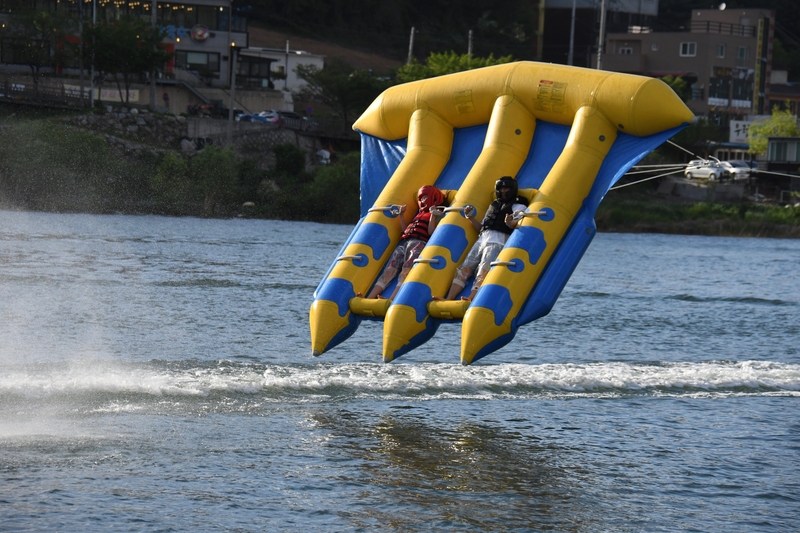 Hold on tight on the fly-fish, speed it up on the water-ski or go higher and tie yourself on to a parachute and go parasailing. Rent a canoe or a sailboat and sail away along the Costa Brava. Had enough rest and like to walk, Lloret de Mar has great hiking opportunities. Discover all the beauty of the coast and the flora and fauna that Spain has to offer. You will be amazed by the magnificent views. Take a walk along the coast towards the castle of Sant Joan in Blanes, you will pass the magnificent botanical gardens of Santa Clotilde, Santa Cristina and Pinya de Rosa. During this walk of about 7km you will be amazed by the stunning views of the cliffs and beaches. 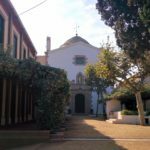 A beautiful walk of13km to the cozy Tossa de Mar you will pass the famous castle en Plaja, follow the Cami de Ronda along the narrow cliffs until you reach the charming beach of Cayelles. You can then follow the way along Cala Morisca until you come in to Tossa de Mar. If you are not an experienced hiker and you are a little scared of walking the routes by yourself, Lloret de Mar has several clubs where you can go to make a groups hike. 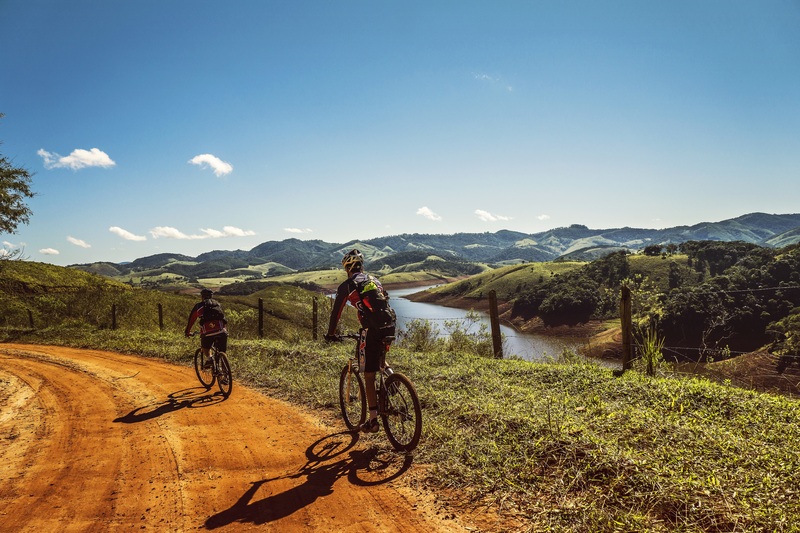 Want to bring your mountain bike to Spain or are you thinking about renting one, the surrounding of Lloret de Mar has certainly enough excitement to offer! Speed up into the hills in the area of Lloret de Mar. What’s more fun than a challenging game of beach volleyball. On the beach of Lloret de Mar, there are always people in for a game. Night out with the family or with your friends and looking for something different. Go play a game of bowling! In the center of Lloret de Mar there is a bowling center where you can go for disco bowling, but also just outside Lloret de Mar direction Blanes you will find a large bowling center. Have you seen all the attractions in Lloret de Mar but are you still excited to see more cultural sights. There are many excursions which you can do from Lloret de Mar, visit the authentic city Girona or visit the famous Gaudi Museum in Barcelona. Do you prefer a day in a fun wild water park or maybe a relaxing day on the catamaran. Do you like music and socializing? Then the excursion to La Siesta & La Masia is definitely something for you, your family and friends! Lloret de Mar has a lovely beautiful hilly area. A quad or jeep safari is the perfect activity to enjoy it. Drive or let yourself drive through the beautiful nature of Lloret de Mar. Visit places you would never go to. Read more to know how you can complete your holiday with these fantastic and very special excursions. The most popular excursion from Lloret de Mar is without doubt the city tour to the beautiful city of Barcelona. From Lloret de Mar, you can take a direct bus to Barcelona or you can go with the combination trip that takes you to the train station in Blanes where you take the train to Barcelona. You will be amazed by the beautiful coastline of the Costa Brava which you will see during your train journey towards Barcelona. If you visit Barcelona you should definitely do the hop on hop off city bus tour, In 1 day you will see all the famous sights of the city and its all up to you how much time you spend at each attraction. 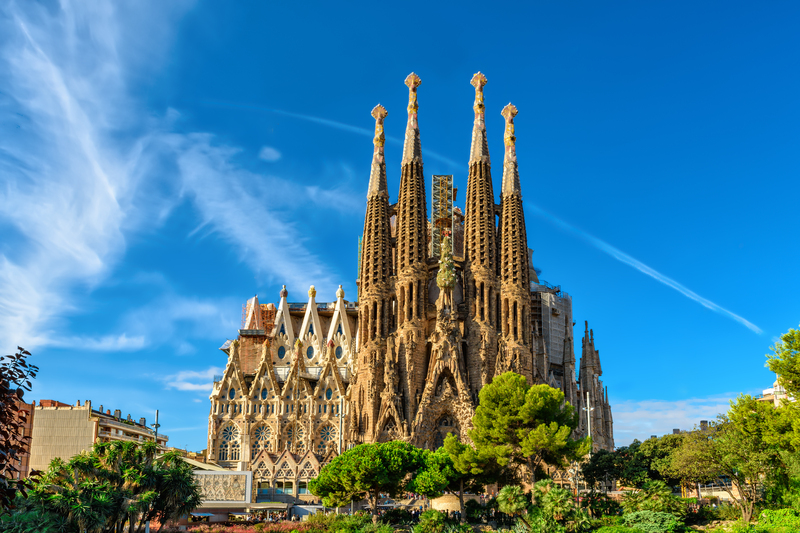 One of the sights you must visit is the Gaudi’s Sagrada Familia Church. And off course don´t forget the Ramblas with its many artists, florists and terraces. Enjoy the sun and taste some of the finest tapas and Sangria. Do you like shopping? Barcelona is the place to be! With 100rds of shops you can spend all day shopping. And when all the shops close you can enjoy Barcelona at night. Go see the impressive magic fountains in Barcelona at Palau Nacional. Barça, Barça, Barça! One of the famous yells in Barcelona and in the region of Catalunya. Football fans and FC Barcelona fans pay attention! Go to Camp Nou, where many international talents have shown their football skills, such as Ibrahim Afellay (since 2010), Robert Enke (2002-2003), Gianluca Zambrotta (2006-2008), Zlatan Ibrahimovic (2009-2010), Lionel Messi (since 2004) and Ronaldinho (2003-2008). With famous trainers as Johan Cruyff and Frank Rijkaard. The stadium is one of the biggest football stadiums in Europe. The atmosphere and the club museum attract visitors worldwide. Not specifically a football fanatic, even then it is an experience! Or do you know the impressive Olympic Stadium. This building is also very impressive to see in real life. Can´t get enough of seeing cultural sights then another must see is the Museu Marítim. In this museum you will find reconstructions of ships from the 15th-16th centuries, old nautical charts and navigation instruments. All this is presented in the old shipyards from the 14th and 15th centuries. One last tip is the Museu Picasso. In this museum, you can find the youth work of this top artist. Together with the collection in Paris this museum is essential to really learn more about Picasso. Last but not least, you should take a ride on the spectacular cableway wich brings you from the port to the hills of Montjuic. 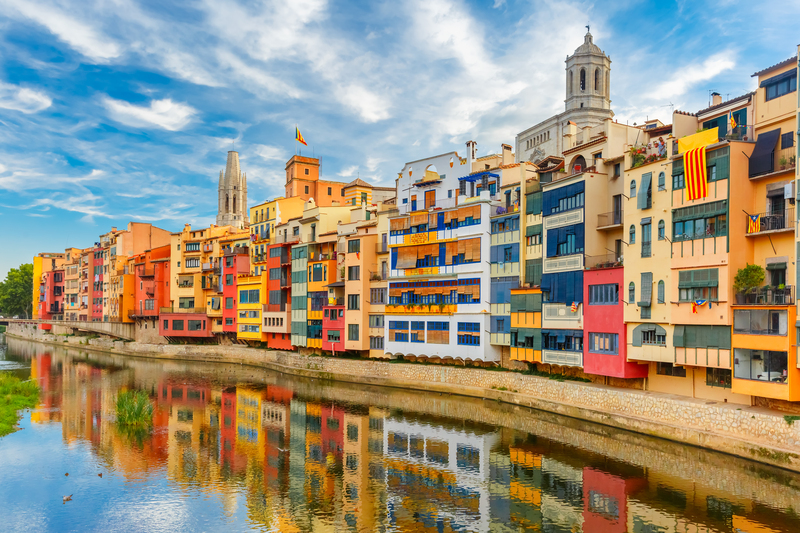 Want to discover the real Catalan cities then you must visit Girona and Empurias. In Girona you should definitely visit the old town with the cathedral and its museum. You can stroll around the charming old streets and enjoy the beautiful Arab baths. So don´t forget your swimwear! Looking for some romance? It is very romantic to walk along the beautiful banks of the Riu Onyar where you can enjoy all the cheerful colored houses. From Lloret de Mar you can take the direct bus to Girona. Bring out the camera! Empurias is a beautiful antique town with a Greek and Roman part. In the Greek part is the beautiful temple AGOR. The Roman area is characterized by two villas with beautiful mosaics. The surrounding of the Costa Brava is beautiful. An exciting ride through the hills combined with a few visits to several authentic villages. Especially worth to visit is the small state of Andorra. The ride itself to the small state is an experience by its own. Driving through the peaceful countryside you will arrive in Andorra, which is characterized by its nature and hospitality. The greatest advantage of this city is that you can shop tax free. So take that credit card with you! 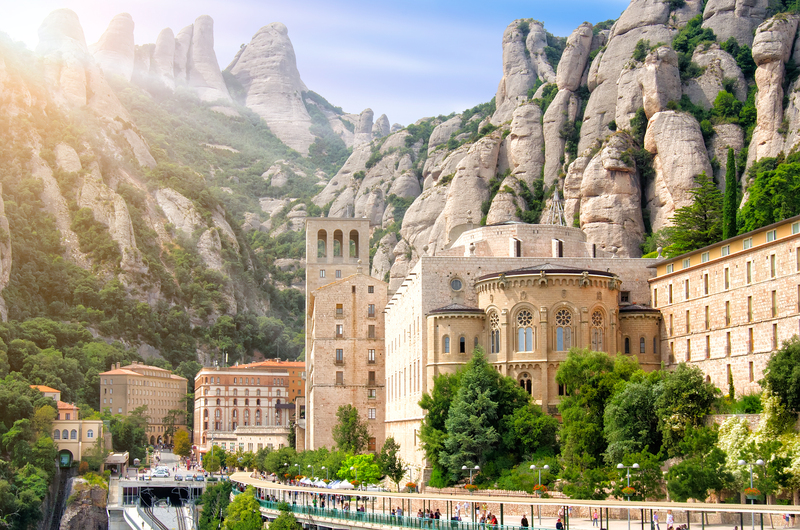 High in the mountains about 30 minutes by car from Barcelona, is the impressive monastery of Montserrat. Montserrat is also perfect for hiking and in the hills are little chapels which you can visit. At the La Siesta you will hear typical Spanish music and you will see traditional dancing. It´s hard to stay in your seat when hearing the music of the passionate Flamenco dance. Clap and swing along to the rhythm of the music. For La Masia you have to go to Tordera. In a typical Catalan Masia (farmhouse) you will see different styles of dance accompanied by live music. Depending on the offer at that moment you can enjoy the typical Spanish evening with a drink and some snacks. You also have the choice to complete it with a three course meal. Looking for a nice evening show to go to with your children. What about a show including horses?! Go back in to time with the Castillo Medieval show. Everything around you is in a medieval style, not only the performance of the Count, Grafin and knights but the entire menu is at its medieval! So for the Burgundians among us this show is definitely something you will enjoy! After the show you can go into the ballroom where you can see an impressive flamenco show. Put your hat on and get ready! Because you can be indiana jones for a day. Really fun to do is a jeep safari. The Costa Brava, which in Dutch means ‘wild coast’, is ideal for this excursion. During the jeep safari it will soon be clear to you why this name is given to the area. Drive through water, speed up the hills and hold on tide, it is certainly an experience! And going along the coast you will enjoy the magnificent views you will see. During this trip you will also make several stops allowing you to visit small villages on the coast where tourist hardly ever come. Not really into city trips or don´t like to walk around for hours just to see something. Lloret de Mar has the solution for you! The Catamaran! A very special tour where you can explore the Costa Brava by boat. You will stop at al the coastal towns like Pineda, Malgrat de Mar, Blanes, Lloret de Mar and Tossa de Mar so Hop on and hop of whenever you want. If you prefer to tan on the deck than no problem it is entirely up to you. A wonderful, carefree day at sea full of fun, including food and drinks. Sunbathe on deck or hang around the cheerful bar, is it getting a little to hot for you? After half an hour sailing the boat will anchor and you can jump overboard in to the beautiful Mediterranean sea for a refreshing splash. You won´t get bored with all the water fun, jump up and down on the water trampoline or join the wild water race on the floating blocks. Or put on your snorkels and explore the under world of the sea. Would you rather stay on board? No problem. They always need a photographer on . The boat sails along the whole Costa Brava and shows you the beauty of the coast. A true beauty! Another excursion that takes place on sea is the excursion to the Medes Islands and Pals. The Medes Islands lie before the coast of Estartit. It is a natural park formed by seven islands. These islands are an extension of the massif of Montgrí in the sea. So don´t forget your snorkel set and discover the beauty under the sea. Pals is a medieval town with an original character. Looking for something more exciting, for the brave ones there is a spectacular excursions. Explore the Costa Brava by air balloon. One thing is for sure you will have a magnificent view of the Costa Brava. And if the weather is good enough you can even see the whole of Catalonia! Temperatures are rising, so what would be more relaxing than a day on the beach! A comfortable sun bed, a parasol besides you, a bottle of sunscreen in your hand and a beach towel underneath you, you are ready for a day on the beach! Lloret the Mar will certainly not disappoint you with its miles of beaches. Thanks to the many different bays there is a large diversity of size, crowds and environment. All beaches have been awarded by the Blue flag, which means that the beaches are clean, equipped with showers, toilets, lifeguards and much more. Read more for an overview of the various beaches Lloret de Mar has to offer. With it´s length of 1,5km this is the largest and most popular beach of Lloret de Mar. The location is ideal for all tourists that are staying in the center of Lloret de Mar. Everything you can think off, this beach has it all! A long and wide lively boulevard full of shops, bars and restaurants. But also everything you need for a perfect day on the beach is available on the beach of Lloret de Mar. For 5euros a day you can rent a sun bed and/or parasols. There is a cozy cocktail bar where you can drink the best cocktails of Lloret de Mar . And there is more than enough water sport activities which you can do. With a beach of 700 meters, this beach is slightly smaller than Playa Lloret de Mar but certainly just as beautiful. Playa de Fenals is sheltered behind the hills therefore is separated from the center and the beach of Lloret de Mar. A beach near Lloret de Mar which isn´t very well known among the tourists. However this beach has more than enough to offer you. Lifeguards, first aid service, showers, a restaurant and rental for sun beds and parasols. This beach is situated next to Playa de Lloret de Mar in a bay below the famous castle of Lloret de Mar. Small fishing boats are located along the coast. A 250 meter long beach, a beautiful piece of nature with its crystal-clear water coming from the caves of the Costa Brava. This very nice but quiet beach is a real attraction for tourists, you can really enjoy a lovely relaxing day on the beach. This beach is just outside Lloret de Mar but still within walking distance. The beach is surrounded by cliffs and palm trees. With the very nice little beach bar that is located on this beach you will definitely feel the atmosphere of an luxuries holiday, Paradise! Clubvillamar has several villas close to this beach. Very nice beach which is perfect for fishing and snorkeling. This beach is close to the famous Sant Joan Castle. Tapas, Paella, Pasta, Pizza, or just a simple burger. Lloret de Mar has more than enough choice. You won´t have to worry that you might be homesick for the food of your country because Lloret de Mar has it all. Especially for you we have put the best, the nicest and the ones with the most atmosphere in an overview below. A modern restaurant where you can also just lounge. The restaurant has an Mediterranean cuisine, they always use fresh products from the market of Lloret de Mar. In the summer this restaurant has a lovely terrace in the garden. A Mexican restaurant in a small street that´s parallel to the promenade of Lloret de Mar, just behind the town hall. With a sombrero on your head and a margarita in your hand you will think you are in Mexico. Enjoy the nachos, Fajitas and the burritos. Small traditional restaurant in a side street in the center of Lloret de Mar where you can eat delicious typical Spanish dishes. Straight away you will feel welcome by the very friendly staff. The restaurant is very popular among Spanish people, we would recommend you to make a reservation. Typical English restaurant located on the boulevard of Lloret de Mar. There is a wide choice of dishes, all for a relatively low price. Argentine restaurant famous for its very good steaks. The restaurant is located in a side street at the beginning of the busy main street of Lloret de Mar. Typical Catalan restaurant on the main road in the area Condado de Jaruco. This restaurant is open 24-hours and is located between Lloret de Mar and Blanes, just before the exit to the area Costa d’en Gallina. Typical Spanish restaurant. On the main road in the urbanization Serra Brava (exit Serra Brava between Lloret de Mar and Tossa de Mar). Delicious seafood restaurant located on the boulevard of Lloret de Mar. Typical Catalan restaurant. In the street between the square with the church and the square with the terrace of Coco d’Oro and disco Bumper’s. Very cozy beach bar on the beach of Canyelles, Enjoy the view and a Mediterranean lunch. Buffet restaurant. Between Lloret de Mar and Blanes, on the large roundabout just outside Lloret de Mar. Enjoyed your evening meal and ready for a nightcap? Or has your evening just started!? There is always something to do in the lively Lloret de Mar. Enjoy a drink during a poker game in the Casino of Lloret de Mar or chill out in one of the bars. LLoret de Mar is international and had a place everyone’s likes. For those who are looking for more than just a very cozy bar. Between the statue of the sailor wife Dona Marinera and the Castell San Joan, you will find this bar on Banys where you have magnificent sea views and great cocktails. Right on the beach, you will immediately get into the tropical atmosphere with the relaxing music on the background and a giant cocktail in your hand. Share one or drink on by yourself. A typical Spanish cafe where the locals meet each other for a drink. On the promenade overlooking the sea you can enjoy a drink in this bar for very low prices. Typical Spanish are the many small bodega bars you see in Lloret de Mar. Enjoy the homemade sangria, the tasty tapas and the friendly Spanish hospitality. For the ones that are unwilling to miss an important football match during there holiday. A sports cafe on the main street of Lloret de Mar. Lloret de Mar, famous for its Sunny Summers and beautiful beaches but most of all well known as the ultimate location to party! No wonder every year more than thousands of youngsters come to this amazing city to celebrate their summer holidays. With more than 400 bars, restaurants and discotheques Lloret de Mar has more than enough to offer. If you just like to relax on a terrace with a delicious cocktail or you want to dance all night, this incredible city full of excitement has it all. Lloret de Mar is a city that never sleeps. Up to sunrise you can party in the many discotheques which you can find on the strip and in the heart of the center. It doesn´t matter if you like trance, dance or R&B you can all find it here. Best part, you won´t need a taxi because all bars and discotheques are in walking distance so you can just hop to one and another. Is it expensive? For most clubs you will have to pay entrance between 12 and 15euros but because of the many tour operations it is easy to get hold of a club-card which gives you terrific discounts and sometimes even free entrance or drinks. To give you an idea of the diversity of clubs, below are listed some of the hottest and most popular clubs you can find in Lloret de Mar. This club is the most popular one in Lloret de Mar and not without a reason! One of the biggest clubs in Lloret de Mar which is located at the very beginning of the lively strip. You can recognize it for its big orange logo in the shape of a face on top of the building. Many German tourists like to come here. This discotheque really knows how to differentiate itself from all the other clubs! By organizing different theme nights and offering parties with international DJ’s this club is almost every night completely packet. Afrojack, Quintino, Martin Solveigh and many more have turned this club upside down! Nothing is too crazy for Tropics. The oldest discotheque in Lloret de Mar but certainly not any less interesting. What makes this club so special is the unusable dancefloor made of glass and the beautiful garden where you can relax with a delicious cocktail. If you like to dance and you are not afraid of a battle than this is the place to be! R&B, Reggae and Hiphop, you will be amazed by the dance moves you will spot here. This cub is very popular among the spanish peole. Move your body to the rythm of Salsa. It´s not only spanish music, you will also here the famous songs of the popcharts. A part from the exciting and lively nightlife Lloret de Mar definitely has more to offer! Weekly you can join the legendary beach party. A relaxing day on a private beach, including drinks, food and nonstop banana boat rides, flyfish or trips on a speedboat. A whole day full of fun. Only the third edition but already incredible popular at the Costa Brava is Totally Summer. Every week 1000nds of youngsters go by bus to this big event which is held in the famous waterpark Isla Fantasia located just outside Barcelona. Around 20.00h, the child friendly park turns into a madhouse full of exciting youngsters that go crazy on the beats of the latest and hottest international DJ´s. Lloret de Mar is definitely one of THE city´s in the world you have to experience at least once in a lifetime! In Spain they have special events that are celebrated. Spanish people definitely know how to celebrate! If you happen to be in Lloret de Mar or its area in that period it is good to be aware of the holidays. Maybe you can join the party! April 23 – In some countries, Valentine’s day is the day of love. In Catalunyathe has a similar feast called San Jordi. Women throughout Catalunya get roses from their husbands, friends and lovers. 23 to 24 June – On the night of 23rd to 24th of June, is the feast of San Juan (San Juan’s birthday). It is an tradition that they announce the summer by making a fire on the beach and popping firecrackers. In Catalunya, the party usually ends with coca de San Juan. This is a special cake made with Cava (a typical Spanish sparkling wine). 23 to 30 June – Fireworks are almost a basic ingredient for a party. During the fireworks competition in Blanes (the neighboring village of Lloret de Mar) the best fireworks are shown. Enjoy the spectacle. Just make sure you are on time, before 22:00 in Playa de Blanes so you will have on of the best spots. Every year thousands of people travel to Blanes just to see one of the major fireworks spectacles of Spain! July 24 – The most famous celebration in Lloret de Mar, Fiesta de Santa Cristina on July 24. On this day they celebrate the patron saint of Santa Cristina.The celebration consists a pilgrimage to the chapel and dancing on the square outside the town hall. Late November – Medieval market in the old town center of Lloret de Mar. Lloret de Mar, you know it´s in Spain but where exactly is it again? In the north of Spain in the Costa Brava, about 75 kilometers from Barcelona you will find the very popular resort Lloret de Mar. The beach of Lloret de Mar is 7 kilometer long and 45 meters wide, divided into different bays.Along the beach you will find a long boulevard decorated with beautiful exotic palm trees that gives you the ultimate holiday atmosphere. Looking for a sunny summer holiday, Lloret de Mar is the place to be. 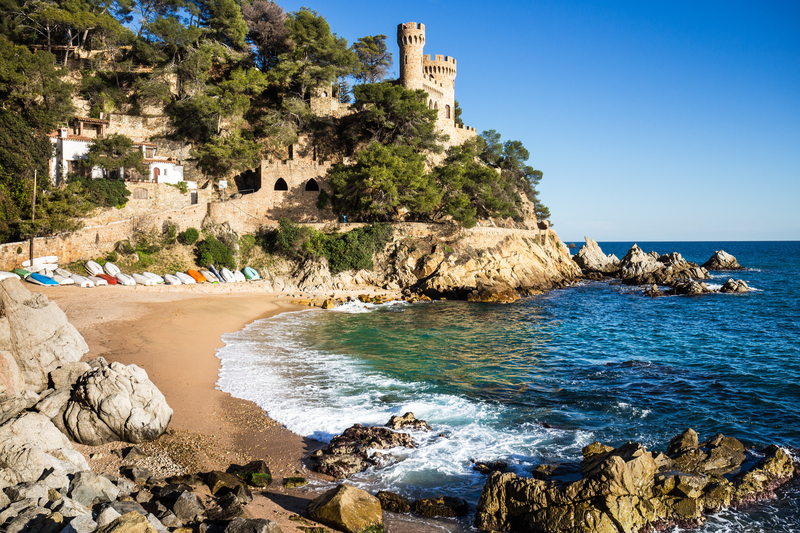 Lloret de Mar has a Mediterranean climate which means hot summers and mild winters. So don´t forget your sunscreen, a day unprotected on the beach and you will be red for sure. Do you like swimming, from the end of June the seawater has a pleasant temperature, before this date the sea temperature is below 20 degrees. Although ithe summers are warm and sunny in Lloret de Mar, there can also be some heavy rain and/or thunderstorms from time to time. But don´t worry, It hardly ever rains more days in a row. 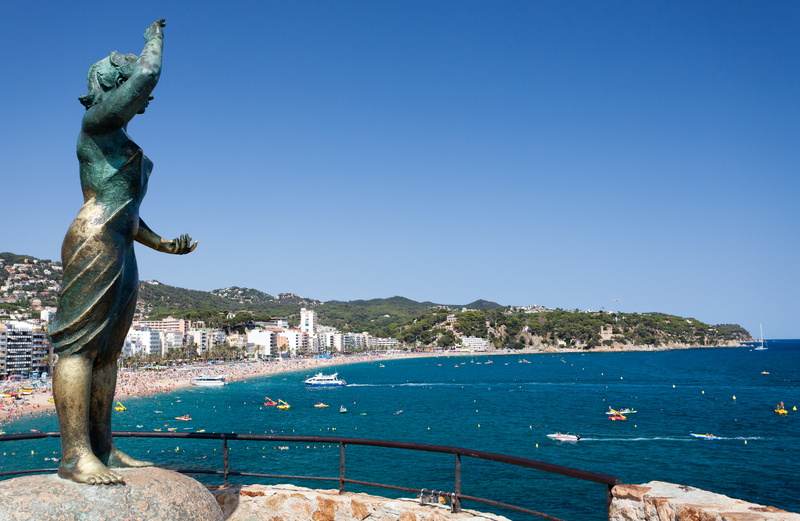 Thanks to its perfect location, Lloret de Mar can easily be reached both by car as by plane. The city is located about 100km from the French border and is located between two airports, Girona and Barcelona. By using the motorways you can drive with your own car to Lloret de Mar. From the French border and from Girona/Barcelona you have to take the AP7. If you come by airplane you can also take the taxi from the airport so you don´t have to pay attention on the road and the chance of getting lost is nil. For a little more excitement, but still comfortable, reliable and speed you can choose the train, The beds in the sleeping train are surprisingly very comfortable, you can even stretch your legs (if you´re not taller than 2.00m). Easily from A to B by plane. You can fly to Barcelona El Prat (IATA: BCN, ICAO: LEBL) or Girona Airport (IATA: GRO, ICAO: EMPTY). Girona Airport is closer, unfortunately not all airlines fly to this airport. On the other hand sometimes the flights to Barcelona are cheaper depending on where you fly from. When planning your holiday don´t forget the trip from the airport to Lloret de Mar. From Girona airport you can take a bus that brings you directly to the center of Lloret de Mar. From Barcelona city center, you can take the train towards Blanes. From there you can take the bus to Lloret de Mar. 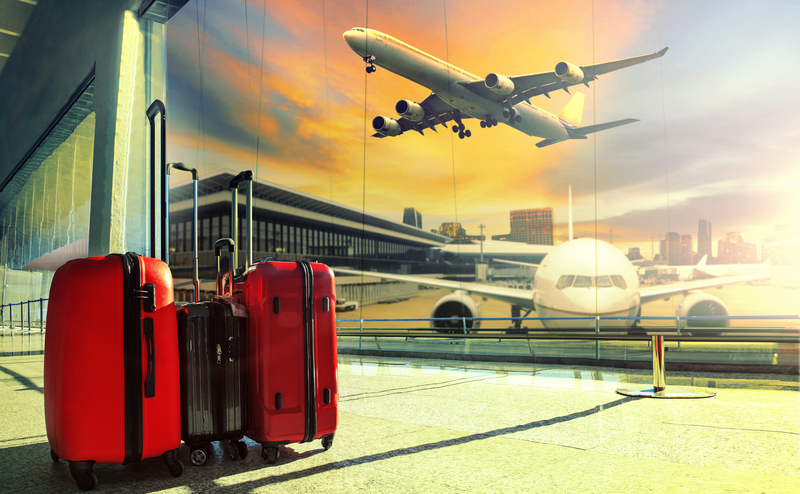 From any airport you can also book in advance online the shuttle transfer or a private taxi. At the airport you can also find some local agencies that offer you transfer. A tip from us is to think about hirering a car. Rent your car at the airport and drive directly to your villa so you won´t have to carry all your luggage. No waiting times and no changing transfer. Very practical! It is also handy during your holiday, you can go wherever you want whenever you want. Getting around in Lloret de Mar. Public transport in and around Lloret de Mar is well represented. From Lloret de Mar you can take a bus and go to villages in the area but you can also take the bus to Barcelona. Alternatively, you can take the train from Blanes to Barcelona, the train stops in several resorts such as Santa Susanna, Calella and Mataro. For relatively low prices you can also take a taxi that brings you from point to point. Ask in advance for a price and avoid unpleasant surprises. The prices can vary depending on date, time, luggage. As you probably already know they speak Spanish in Spain. Fortunately most people that live and work in Lloret de Mar speak perfectly English. Practiced some Spanish sentences before your arrival but can´t understand a word the Spanish are saying? Many Spaniards in Lloret de Mar speak Catalan which is different from the Spanish language. In Lloret de Mar is the default time zone is UTC / GMT +1 h. Also known as the Central European Time zone. Lloret de Mar also has summer and winter time where you resistance the clock one hour. 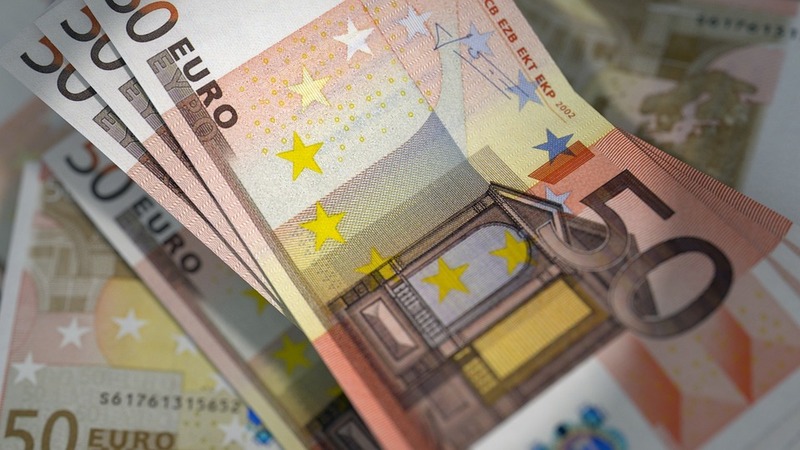 In Spain you have the euro as in most European countries. The best way to get cash is by using a ATM. In Lloret de Mar you can find an ATM on almost every street corner. It is comment to give a tip to waiters, guides and taxi drivers of about 5 to 10%. Of course it is entirely up to you if you find the service tip worthy. In Lloret de Mar the tap water is drinkable. However it is not recommended, in some areas there is still to much chlorine in it.It is no problem to use the water for brushing your teeth but for drinking we would advise you to buy bottles of water. You can buy a 5 liter bottle for only 1,20euro. Lloret de Mar is a safe city to get out and about and even at night it is safe to walk around. Advised is to look after your bags, regularly pickpockets are active in the busy shopping streets or in the bars and discotheques. Keep your bag close to you. We always hope you won’t need it but just in case we have put some important phone numbers below. Want to make a phone call during your holiday in Lloret de Mar but forgot the landcode. You can all find them below. For specific, detailed information you can always contact “Oficinas de Turismo”. For example if you need a map of Lloret de Mar, more information about excursions, hiking or cycling in the area. Lloret de Mar, you’re in control! Make your holiday as Luxurious as you want it to be. Lloret de Mar offers you plenty of activities, excursions and relaxation. An exciting evening out in the town, from chilling on a terrace to dancing up to sunrise. And for the children a thrilling ride on the banana boat or go with the whole family on a jeep safari to discover the inland of the Costa Brava. Need a moment of relaxation, go to a Spa and Wellness or take a walk in to the breathtaking botanical gardens. 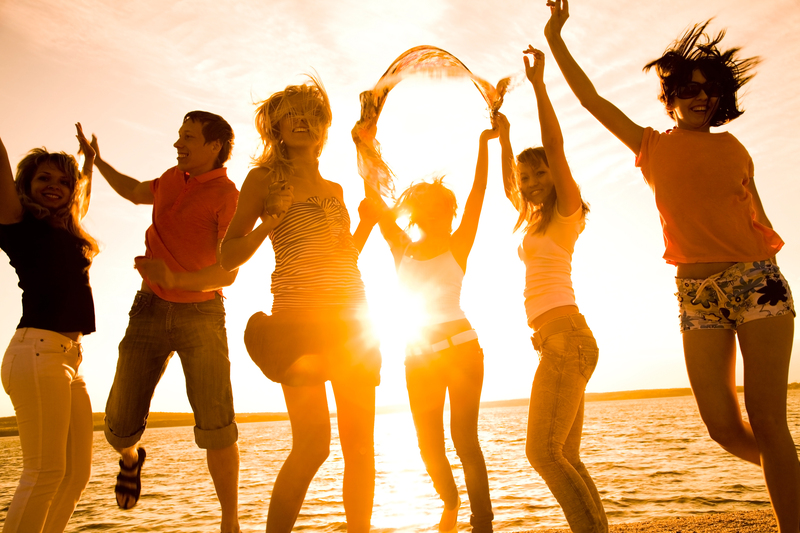 You´ve probably noticed that Lloret de Mar isn´t only a place to party. It definitely has more to offer. And the good part is that you can have it all for an affordable low price! When are you coming to Lloret de Mar? Wait no longer, book your Villa in Lloret!